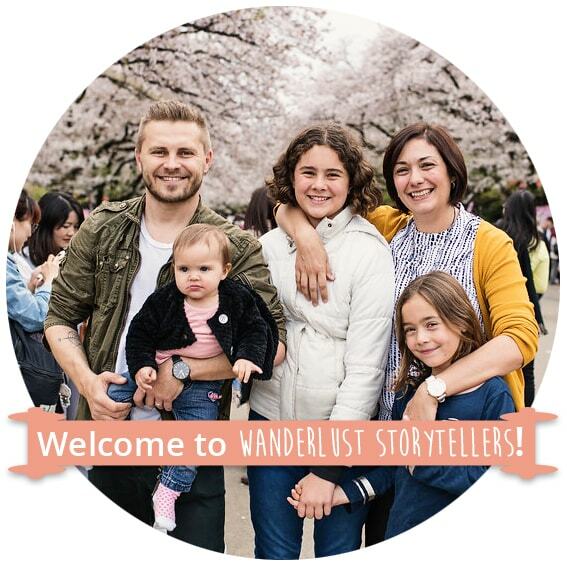 Ultimate Guide to the Best Travel High Chair Reviews of 2019! After the best travel high chair or the best portable travel high chair!? Travelling with a baby is easy, when you have the right baby travel accessories with you. One of the most important travel essentials that your baby will need, apart from the travel car seat, or a travel pram, is of course the travel high chair! 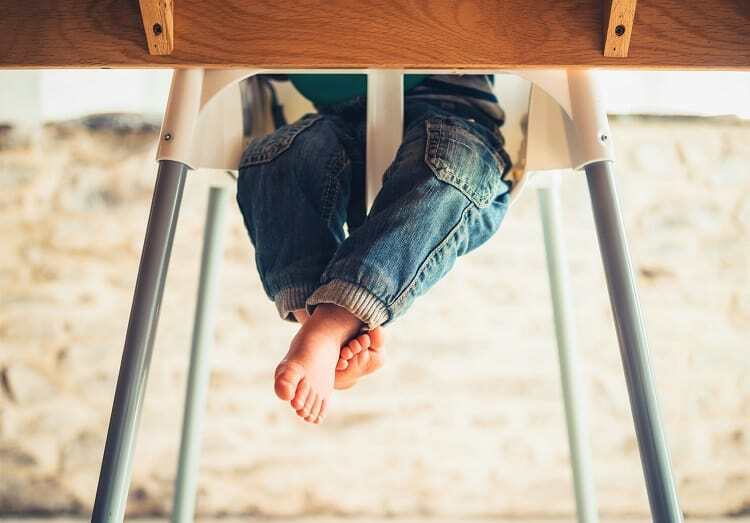 When you are travelling around, you might often find that high chairs are not readily available, and often, when they are, they aren't always equipped with correct restraints to keep your baby safe. We figured that for our travels with Avalee (our now 2 year old), the best and the smartest way to fix the problem was to take a high chair with us. There are plenty of benefits of having a portable high chair when your travel! All you got to do is choose the best one for your type of travel. 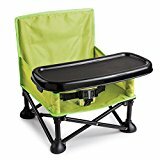 I have compiled a list of the best portable travel high chairs for you, together with detailed travel chair reviews and what to look for in a travel chair as well. Why you SHOULD Invest in a Good Quality Travel High Chair? What Look out For in a Portable Travel Chair? 1. Babies are happier to eat sitting in their own chair. Feeding your baby can be a hustle even when you are at home, not to mention when you travel. 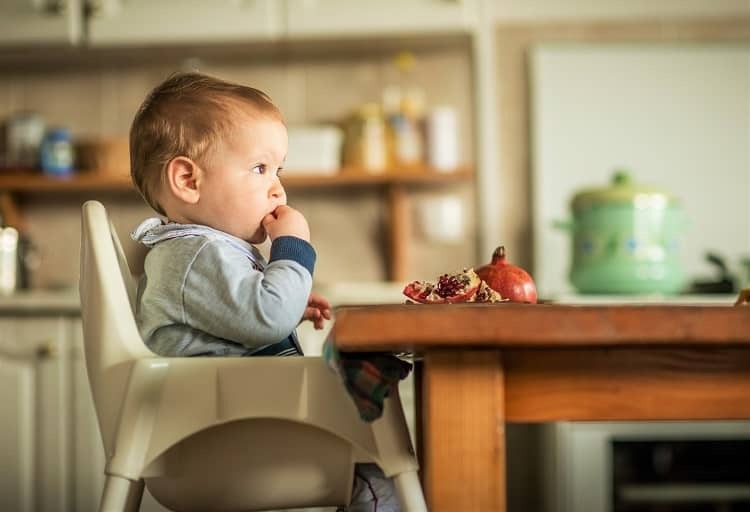 Babies tend to get easily distracted, so the best way is to feed them whilst they sit in their own comfy high chair. 2. Your baby is safe and secure. When you travel around, not every place that you stay at provides you with a high chair. 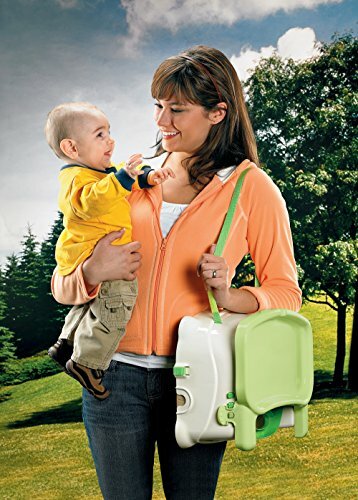 So, when you go on your next vacation, bringing your own portable booster seat or the travel high chair with you. This will help to minimize the stress that comes before feeding time for both you and your baby. 3. You can eat in peace too. We all know too well, how fun it is to eat a meal with your baby on your lap. Yes, it is a bit of a challenge and usually you end up more frustrated than satisfied. Therefore it is in your best interest to keep your baby happy, which brings us back to point No.1 above. Below is a comparison chart of all the top baby & toddler portable travel chairs; which are mentioned in this article. You can then read my baby travel chair reviews below featuring the best travel booster seats, best hook on high chair and of course the traditional travel high chairs. Here are a few factors that you should take into consideration before choosing a your portable high chair. 1. Is the travel high chair easy to use? It is super important to find a travel high chair that is suitable to the style of your travels or best for the destinations that you are going to visit. 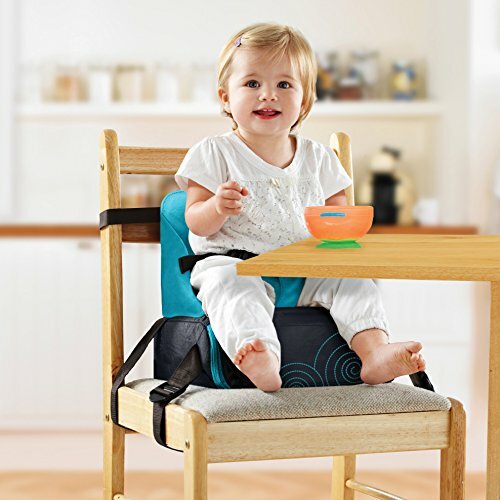 The most easy-to-use portable high chair for travel is of course the booster seat. This type of high chair is easily mounted on any chair and usually comes with its own back support. 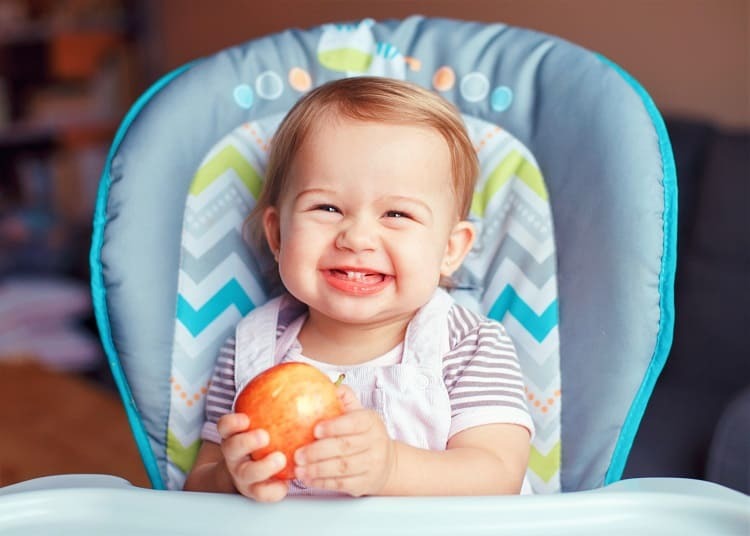 If you choose to purchase a traditional travel high chair, although it may be not as easily portable as the booster seat (due to its size), this type of high chair may prove to be a better option especially when it comes to the long terms stays. Added bonus here, traditional high chairs can stand independently. When you travel with a portable travel chair, there are two main things to consider. These are of course, size of the travel high chair and its weight! In my opinion, the best travel high chair is the smallest travel high chair! No-brainer here, right? The smaller the chair and the more compact design, the easier it is to travel with. The booster travel seat wins here! Alternatively, you can choose the option of a larger portable travel chair that collapses easily to a much smaller package. I have included one of those in my top ten list. I have used it personally and I recommend it! As for the hook-on chairs or straps, these are easiest to transport and typically smaller in size. However, these are my least favorite ones, when it comes to the comfort and the ease of use. 3. How to keep the portable high chair clean? As we travel, we always try to find that type of high chair that is easy to clean. And the winner here is once again the booster baby travel chair. These are usually made with a easy to wipe fabric and typically do not have too many crevasses that that food scraps can get stuck in. Saying that, although we tend to want purchase the best for our kids, practicality of the travel high chair should always supersede its appearance. Simple is best here! However, if you go down the road of choosing a more fancy baby travel high chair, then look for an easy to remove and machine washable fabric as well. This way, anything hard to wipe, will be properly cleaned anyway. 4. Is the baby travel high chair safe to use? When choosing a suitable travel high chair seat, the most important is to find the safest option of course. The most important things to look at before you purchase the most suitable baby travel high chair is the harness and stable design. Some booster travel chairs and travel chairs come equipped with 3 point harness whilst, whilst others may have a 5 point harness instead. So, keep an eye on that too. The least favorite of mine is the hook-on baby travel chair. Although these have been extensively tested and are a very secure when installed correctly, I always feel better to put my baby in a booster seat or a high chair instead. I guess, it comes to a personal preference here. There a three different types of travel high chairs available on the market today. These include the traditional booster seat, hook-on chair and of course the traditional high chair. 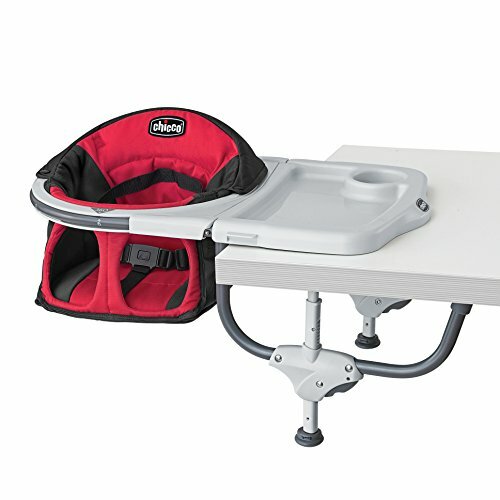 Booster seat is usually my top pick when choosing a portable travel high chair. 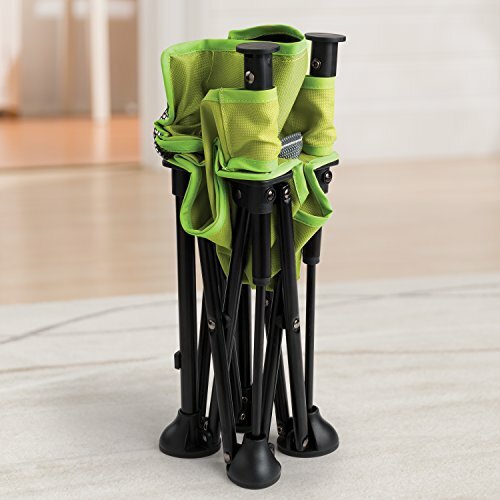 Because these types of high chairs are typically the easiest to use, due to the fact that you can literally mount them onto any chair available. On top of that, some travel booster seat options come with extendable legs, which allows them to become independent from any chair as well. Two in one here! On our travels through Europe we have used the Summer Infant Pop n Sit Portable Booster Seat and we loved it! To me this is the best travel high chair for sure! Hook-on chairs biggest benefit is that they are easily collapsible and relatively small in size. They do usually come with a their own travel bag, which makes it easy for you to travel with as well. A hook-on chair attaches to a table top with its rubber handles that tighten securely to the flat surface. Once the chair is in place, your baby can sit comfortably and nice and snag to the table. Hook on chairs are a great option of a travel chair, but only for babies that are between 6 months to 37 Lb. Which unfortunately limits its use for most travelers. When Avalee was a baby and we were going for a short holiday, this type of high chair was the best for us. And the one that we loved the most was of course the Chicco Caddy Hook-on Chair. Traditional high chair is a free standing baby chair, which is independent of table tops or adult chairs. The beauty of this type of chair is that the legs of the chairs are typically adjustable to sit just at the right height to suit any table. 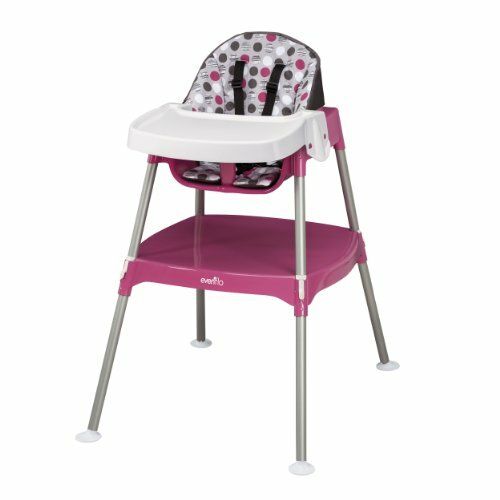 Free standing travel high chair is a great option, when you are looking for a high chair that will grow with your baby. These chairs usually come with easily adjustable harness which keeps your baby secure regardless of age. Traditional high chairs are typically larger in size and weigh more in comparison to the booster seats or the hook-on chairs. However, they are still easily collapsible and depending on a company, usually come with a carry bag as well. When we travel to a destination knowing that we will spend more than a week in one place at a time, we tend to take a traditional high chair. The one that we love best and use personally is Ciao! 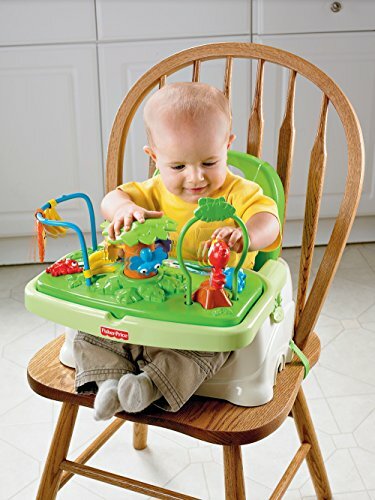 Baby Portable High Chair. Truth be told, when you look for both travel high chairs and portable high chairs for sale, you will quickly find out that they are technically the same. There are only a few minor differences when it comes to their portability. The portable high chair, as the name suggests, comes in a form of a baby travel chair that is easy to transport. This term is also used for smaller sized high chairs as well. As for the travel high chairs, these are typically the selected type of a high chair that sits on a lower scale when it comes to its weight and are easy to collapse for transport. Saying that, both portable and travel high chairs for babies are suitable to use in and outside the house. Below you will find the best portable travel high chairs available on the market today! We will help you find the best baby travel chair for your baby. I will outline the top features, the pros and cons of each in detailed travel high chair reviews, which should help you choose the best portable high chairs 2019 has on offer for you. 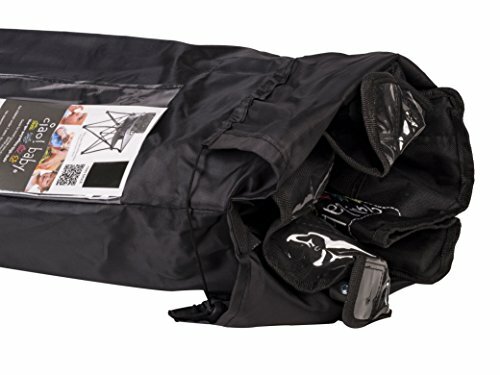 Summer Infant Pop n Sit Portable Booster comes from one of the best family of baby products on the market today and it is my No.1 best portable travel chair for 2019! 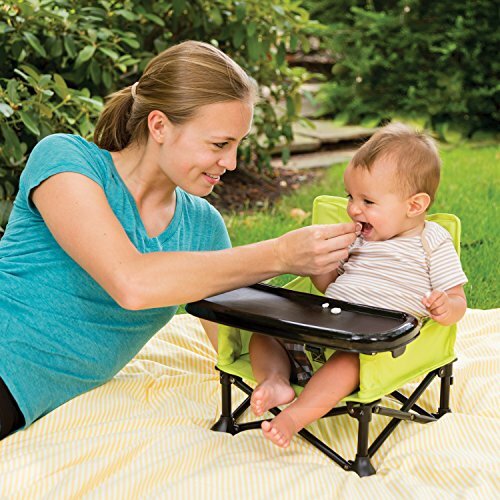 I love everything about the Summer Infant Pop n Sit portable high chair! First of all, it is the best choice for a travel high chair by far. 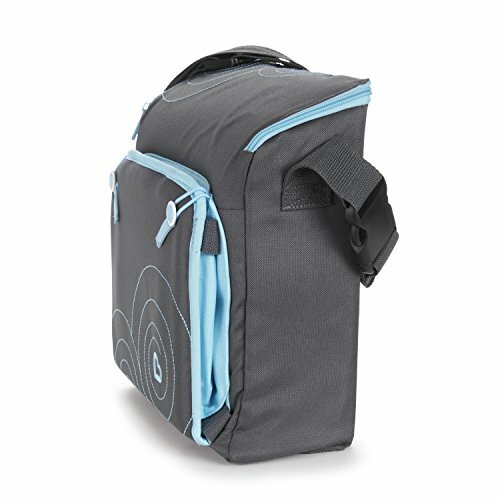 This is of course due to the fact that is folds and fits in an easy to carry shoulder strap bag. This way I can fit this baby high chair anywhere! This chair comes with a detachable, BPA free and dishwasher safe tray. That means, no matter what your baby gets up to here with their food, you will be able to just pop it out and straight into the wash.
Another bonus here, this baby booster chair comes with safety straps for mounting it on any adult chairs. So no need to get any additional accessories here! The chair is recommended to use only for babies from the age of 6 months and until they reach the weight of 37 Lb. Yes, they do grow out of it quite quickly, however in the meantime Summer Infant Pop and Sit portable high chair will keep your baby safe, comfortable and happy. >>> Click here to check the current price on this chair or click the button below. 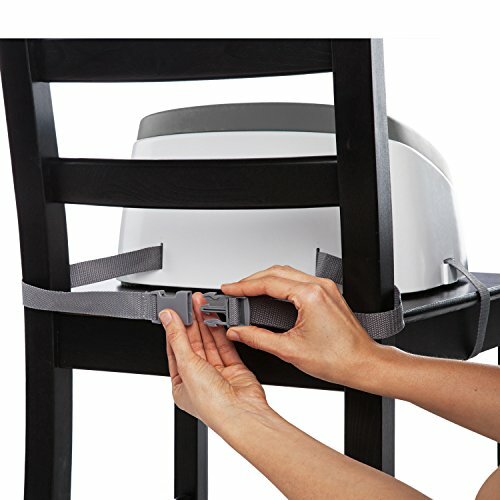 If you are looking for the easiest to clean and small size booster seat, then the Ingenuity Smart Clean Booster seat is the one for you. This Ingenuity booster seat is extremely light weight and comes with all the bells and whistles including the super comfy removable foam seat, machine washable straps and all looking super sleek and modern. You can take this booster seat literally anywhere. You can use it at home, you can keep it in the trunk of your car for when you go to eat out, or you can use it on your travels! Please note, that this booster seat is doesn't have a back rest, and it is not suitable for babies younger than 16 months. 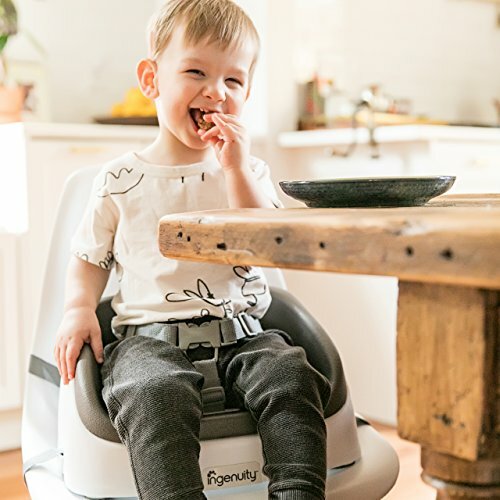 The Munchkin BRICA GoBoost Travel Seat is a brilliant product for those who are after a travel booster chair that is lightweight, portable and that can fold up (it has a built-in carry strap too). We absolutely love the affordable price tag. We also find that it is really quick and easy to install. Whilst you can't remove the material, we find that it is easy to keep clean as the material is waterproof and you can simply wipe and go. The storage compartment might be small, but it is really handy to hold your supplies for the meal out. The things that I love about the Chicco 360 Hook On Chair the most are the 6 different positions that you can lock the seat in, that it collapses flat, and that it comes with a travel bag. 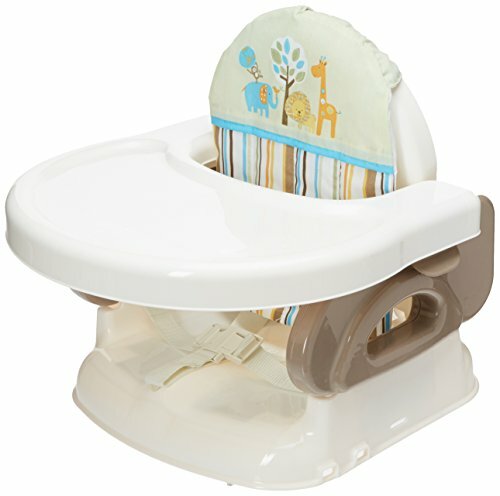 The ratchet-lock of the Chicco Caddy hook on chair allows you to attach the chair to most of the table tops. All of the components are easy to clean. The fabric seat is easy to remove and it is machine washable as well. The plastic tray is dishwasher safe, so you don't even have to make your hands dirty. Sounds good? You know it is! The two main things that I love about the Summer Infant baby seat are that it can grow with my baby to the toddler age and it folds nice and small for travel. What also helps along the way is that you can easily adjust the seat height, which is good because not every table top is the same height either. 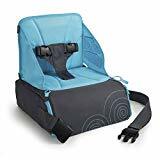 Summer Infant deluxe booster seat is one of the lightest boosters seats that you can find on the market today and together with its compact fold design, you can see why it made to my top ten baby travel chair list. It is a little tricky to get used to putting on and taking off the tray, but it is a minor problem when everything else works well! >>> Click here to check the current price on this booster chair or click the button below. he seat is not only softly padded, it is also reclining. Yup, this chair will support your newborn and continue to do so in the toddler stage as well. 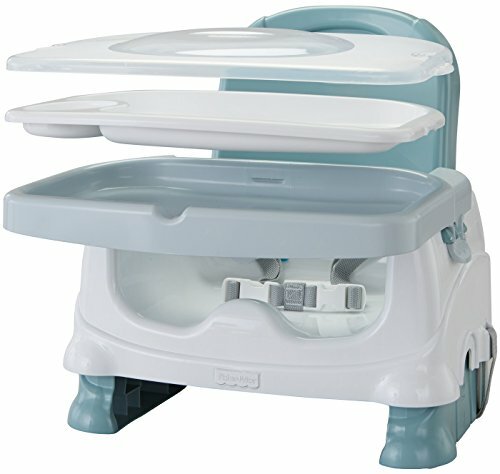 Just as the previous booster options, the Fisher Price Spacesaver high chair seat pad is machine washable and the tray is dishwasher safe as well. What more can I say? This seat is an all-in-one great travel high chair! >>> ​Click here to check the current price on this high chair or click the button below. 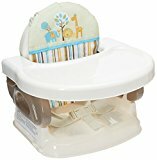 If you are looking for a good travel booster chair that doesn't require any machine washing, and that it is easy to spray and wipe all around, then the Fisher Price Healthy Care booster seat is the perfect choice for you. Personally, even though I do love the fact that it is easy to clean, I still choose the comfort for my baby. This is a great travel seat, but not as good as the previous one in my eyes. If you are looking for all inclusive package, then Fisher Price Portable High Chair has it all! Not only you get a relatively light weight travel highchair that can fold easily, you get a fully loaded entertainment tray as well. We used this one quite a lot when Avie was little. The rain forest idea is brilliant and provides tonnes of fun for the little ones imagination. Added bonus here? If you have a Fisher Price travel high chair, then you can pretty much guarantee to have extra few minutes to eat your own dinners in peace. 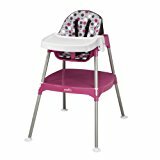 The Evenflo Convertible high chair Dottie Rose is a traditional design high chair. It is easy to clean and easy to travel with. The convertible design allows you to change the high chair three ways. You can convert it from a typical high chair to a short chair, as well as to a chair with a table. Win win here! 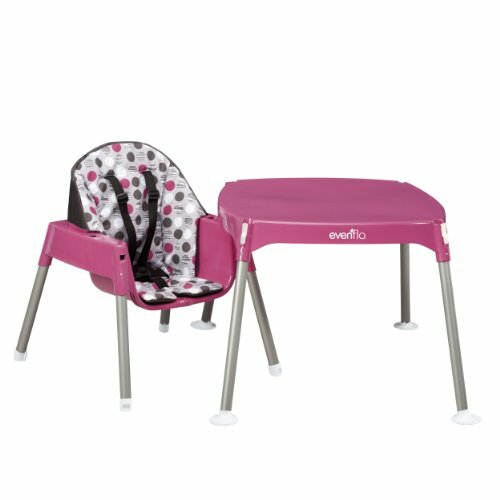 Don't worry, there are other colors of the Evenflo portable high chair as well. You can choose the right color to suit your baby. It is a more expensive option to the travel booster chairs, however, bare in mind that this is a chair that can stand independently and doesn't require strapping to an adult chair or a table top. Bonus here! 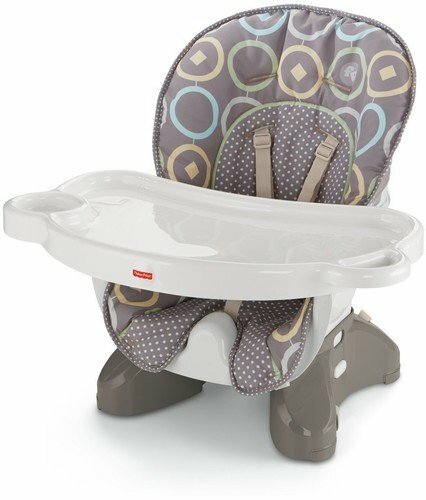 >>> Click here to check the current price on this high chair or click the button below. The Ciao portable baby high chair is one of my favorites when it comes to weekend getaways and camping. It is a great chair to throw in the trunk for when you are going for a picnic or other short types of trips. I treat this chair just like any other camping chair that we have. It is well made, sturdy and easy to clean. Both, the fabric seat and the plastic tray, are well designed and made to last. I love this chair and I know that you will too. We hope you found our portable high chair reviews and comparison table helpful and that you managed to find a chair that is right for your baby and your style of travel. 1. If you are heading on an proper holiday that requires air travel - whether it is domestically or internationally, I would recommend that you take along a travel high chair that will sit nicely on an actual chair. You also want one that is easy to fold away as well as one that is lightweight. 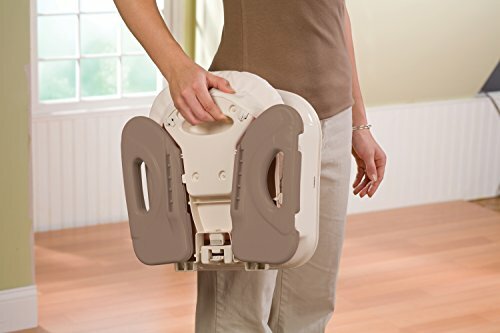 Our favorite portable travel high chair is the Munchkin BRICA GoBoost Travel Booster Seat. 2. 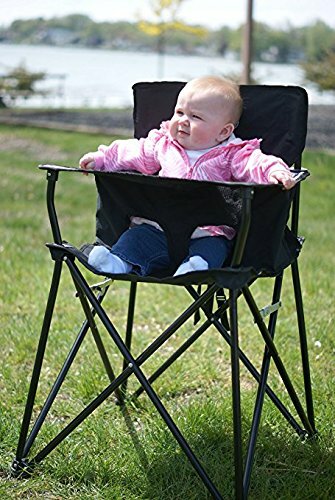 If you are heading on a day trip, camping or a weekend away and will only be using your car, I would recommend a stand-a-alone high chair. My favorite stand-a-lone portable high chair is the Ciao! Baby Portable High Chair. We would love to know which hair chair you have decided to purchase, please leave us a comment below.